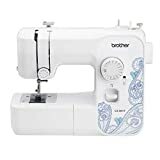 Whether you are looking to experiment with new crafts, to be able to make quick sewing fixes, or to turn your hobbies professional, there is a sewing machine to suit your crafting needs. With hundreds of options out there, choosing that perfect machine can see more complicated than your first sewing project. But choosing doesn’t have to be difficult. To aid you in your search, we have put together this sewing machines buying guide to have you straight stitching and cross stitching in no time. Mechanical Sewing Machines: These are traditional sewing machines that do not require electricity to run. Although they offer old-school technology, there are still a few new models being manufactured and they are very cost effective to buy and to run. Mechanical sewing machines can produce lock stitches and chain stitches and are best suited for light to medium weighted fabric. Electric Sewing Machines: Most modern sewing machines are electric, and are the best all-round machines. These normally have two threads that create a straight stitch on both sides of the project simultaneously. Operated by a foot pedal on the floor, sewing speed is completely controlled by the sewer: the harder you push, the faster it will sew. Electric sewing machines can handle a multitude of material and threads and are suited for beginners as well as experts. Computerized/Combination Sewing Machines: Including a computer, these sewing machines are more often than not combination machines which are machines that can handle a multitude of tasks and projects. They have programmable options, many stitch functions, and a touchpad or key display for easy selection. 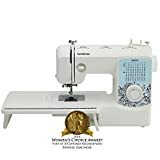 Coming in an array of models and offering a variety of crafty functions, these are great machines for the sewing enthusiast. Embroidery Sewing Machines: Similar in shape and size to ordinary sewing machines, embroidery machines’ attachments are designed specifically to do embroidery stitching. 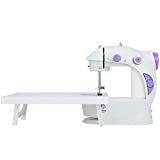 Often falling into the computerized sewing machine category, these machines can handle elaborate patterns and allow crafters to download and scan as many options as they like. 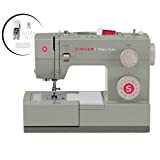 Thread Sergers/Overlockers: Used for sewing seams, tasks like edging, trimming excess fabric, fixing zips, and putting in button holes are easy with these specialized sewing machines that offer functionality that a standard sewing machine doesn’t have. Often used by tailors, clothing makers, and avid crafters in conjunction with their sewing machines, sergers add a neat and professional finish to almost anything. Mini Sewing Machines: Mini sewing machines are small, portable, and great for those quick patchups. Their size and simplicity make them an ideal choice for kids, beginners or sewers needing something small enough to take anywhere. Capable of straight and cross stitches, these machines can handle a small sewing emergency like a pro. Quality & Convenience: Experienced and novice sewing machine owners alike prefer solid, well-built machines that are easy to operate, have clear instruction manuals for getting started or troubleshooting, and are easy to switch between stitching types if they have more than one. 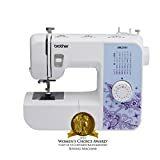 Options: Sewing machines that have numerous features are well reviewed by their owners because they provide more flexibility and sewing functions all in one machine. Touch screens, USB ports for embroidery/combination machines, and multiple stitching types all allow more added functionality. Portability: Lightweight, portable machines are appreciated by their owners for the convenience they provide. Especially for people that don’t have a dedicated sewing room, being able to easily move their sewing machine when they want to use it and when they need to store it away makes using their machine much more enjoyable. One of the first things to ask yourself when choosing your sewing machine is: What projects do I need it for? Do I need it for sewing, embroidery, quilting or all of the above? Do I want it for fun sewing or professionally finished crafts to sell? Am I looking for another specialist machine to compliment my current sewing machine? 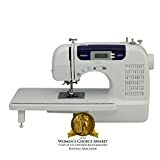 The answers to these questions will determine whether you are looking for a basic electric sewing machine or a computerized combination machine. Think about how much sewing you plan to do. If you are a beginner, or will be doing the odd project, then a simple entry-level electric sewing machine is just what you need. If you are a regular crafter who wants a lot of options and a lot of functionality, then you may be more satisfied with a higher-end investment. Consider your sewing goals. For simple sewing, simple electric sewing machines are best suited. For added options like quilting and embroidery, finding a combination machine will provide much more functionality. When choosing build materials, the more plastic a sewing machine has, the lighter and cheaper it will be. The more metal parts it has, the more durable it will be. Feet: Also known as presser feet, these metal plates press down on the fabric as you sew and come in a number of varieties, including feet specifically designed to do certain things like make zipping and buttonholing easy. Buttonholer: This feature enables sewers to easily and automatically make professional buttonholes. Needle Threader: A tool that aids with threading the needle on your sewing machine. Bobbin: This can be either metal or plastic, and is what thread is spun onto before being fed through the needle. It is housed in the bobbin case. An integrated dual feed is a handy sewing machine function that enables you to sew two pieces of fabric together without the material bunching up. A metal needle plate that includes a hole for the needle to pass easily through is a sewing machine necessity. A sewing machine with two twin needles will give you the ability to experiment with more decorative and intricate stitching. Consider the investment you want to make. If you are buying a sewing machine as a long term investment for a lot of crafting needs, consider a higher-end machine. As a beginner you may want to consider an entry level machine giving you the chance to get used to simple functions. Finding a simple machine as a beginner but that allows for future add-ons will help you develop your skills as you gain experience. There are a number of features to look for in a good quality machine. 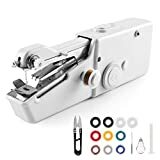 They include back, straight, zigzag, and button stitch functions, feet that perform a variety of crafts, an automatic buttonholer, automatic needle threader, easy to use controls, a good warranty, and have a lightweight design. Buying a top rated brand will ensure easier maintenance and replaceable parts, which means a longer sewing machine life and a better investment. Universal needles are sharp enough for woven fabrics and come in a variety of sizes. Ball point needles pass through threads without piercing them and are ideal for spandex and knitted fabrics. Embroidery needles have large eyes and protect fabrics from tearing during embroidering. Metallic needles have sharp points and are for metallic threads only. Sharp needles are perfect for projects involving elastic, lightweight material. Janome: Starting in 1979, Janome was the first to offer embroidery sewing machines for the home. Known for cutting edge sewing machine technology, the Janome name is synonymous with quality sewing machines. Brother: Brother was formed in 1954, and is on the forefront of home appliance technology. Winning consumer awards in 2014 for their home office equipment, their sewing machines enjoy the same owner satisfaction. Singer: Singer, a leading sewing machine brand, has been making quality machinery since 1851 and invented the first electronic sewing machine.